More than 20 percent of the gains in health insurance under the Affordable Care Act (ACA) disappeared by the end of 2017. The uninsured rate for nonelderly adults increased by 1.3 percentage points in 2017, after decreasing by 6.3 percentage points between 2013-2016, after the full implementation of the ACA. The ACA is associated with large gains in coverage and access to care. As the partial loss of these gains over 2017 shows, this increased coverage isn't necessarily permanent, and ongoing policy debates will have an impact on health insurance coverage. 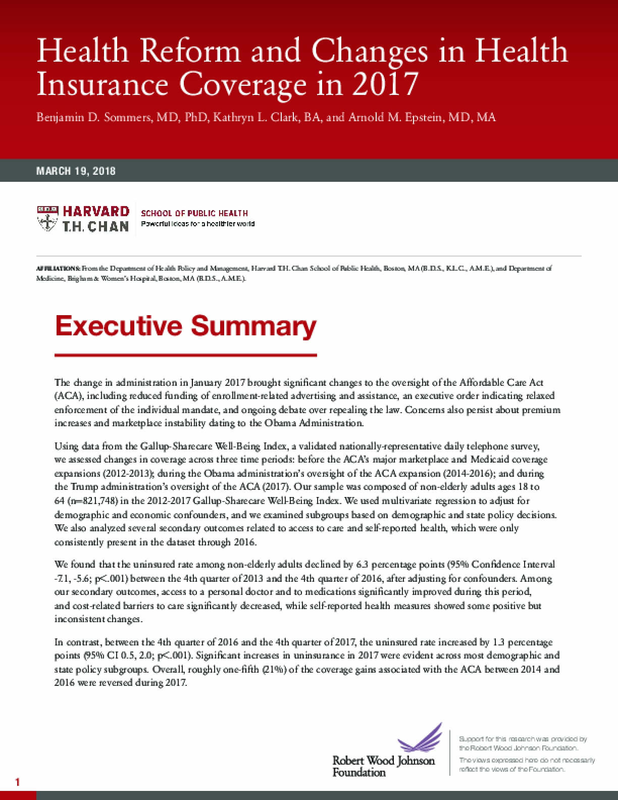 Continued monitoring of changes in coverage levels, utilization of health care services, and population health are needed to fully understand the effects of policy changes on the ACA's impact. Copyright 2018 by Harvard University T.H. Chan School of Public Health. All rights reserved.